I've always thought honey was, well, honey colored. Silly me. 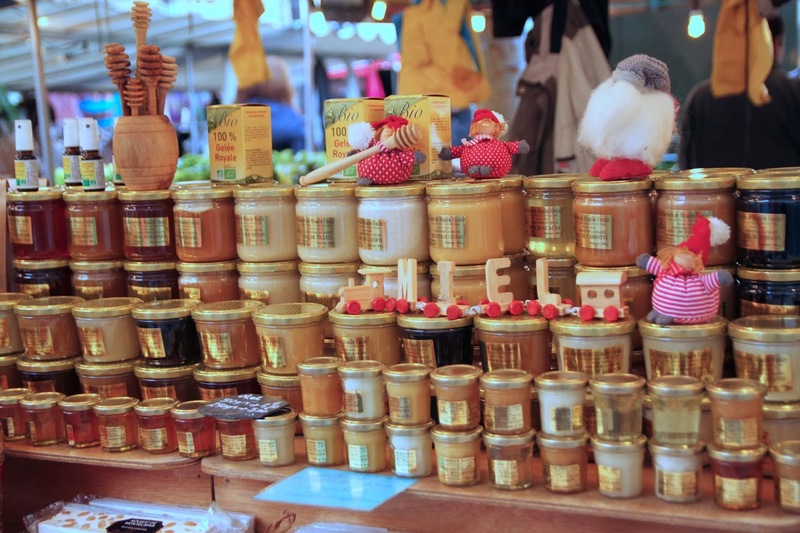 It turns out that there are nearly as many varieties of honey as there are of cheese (perhaps I exaggerate). Here, a deep black Sarrasin, a soft white Fleurs de Garrigues, and a sunny golden Tournesol. They look like night, day, and the sun, and they taste as different from each other as night and day, too. 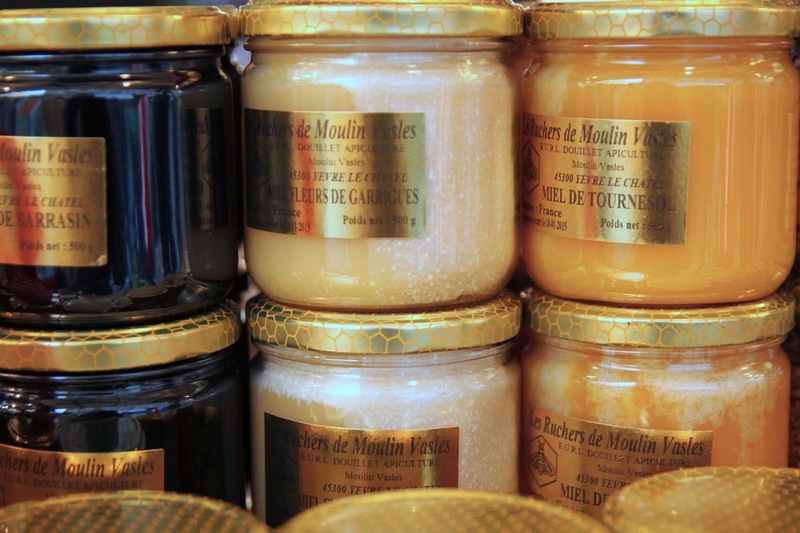 Sarrasin is an almost bitter, molasses-y honey from buckwheat flowers; garrigues is a thick, spreadable light honey from scrubland plants; and tournesol is a creamy, warm, sunflower honey. Of course, some honeys are, in fact, honey-colored -- gorgeous amber. But that doesn't mean they all taste alike. 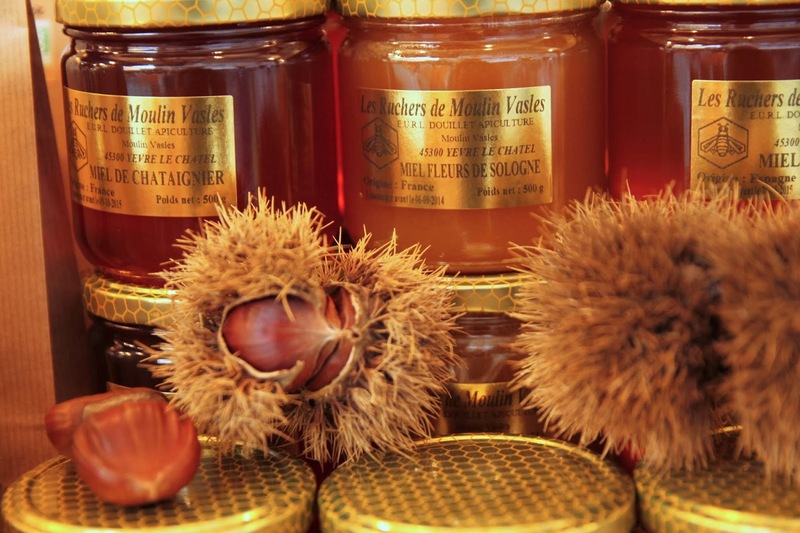 For example, the chataigner, whose chestnut origins are highlighted by the raw chestnut decorations, is a much deeper and more complex flavor than the Fleurs de Sologne, which has a light and floral aspect. 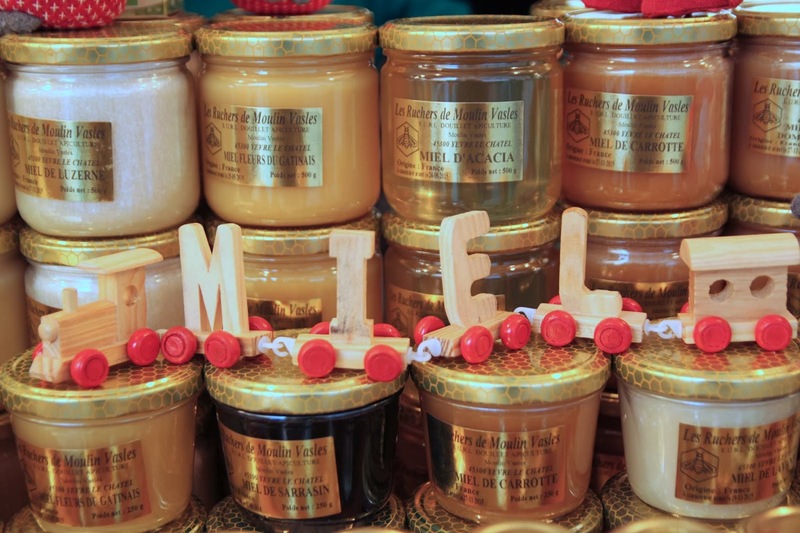 The nearly transparent Miel d'Acacia is frequently used to add sweetness but as little honey flavor as possible. Meanwhile, there's a carrot honey right next to it that is actually so orange it looks as if it's got carrots puréed right in it. It does not; it's just honey made from bees gathering nectar from carrot plants. 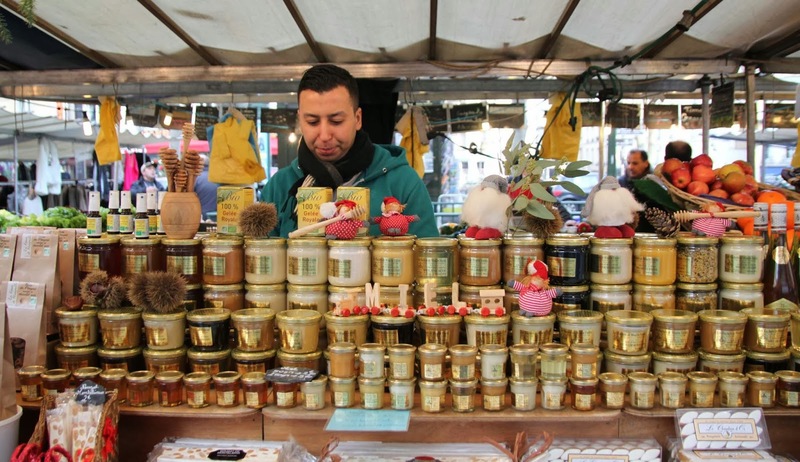 My favorite honey stand is at my thrice-weekly market at Place Maubert on Tuesdays, Thursdays, and Saturdays. Tariq is friendly and incredibly knowledgeable about the honeys. When he tells me to get a Bruyère Blanche saying both that it's a rare one for him to get a hold of and also that it has strong hints of caramel, I jump at the biggest possible jar. And sure enough, it's like eating the most perfect honey-caramel ever. It is far, far, far too delicious to waste as a tea sweetener, and we only use it for spreading on toast and/or cheese. Bruyère Blanch means White Heather, and perhaps the heather is white, but the honey is amber. Best honey I have ever tasted. Or is white, creamy, floral Tilleuil the best honey I've ever tasted? 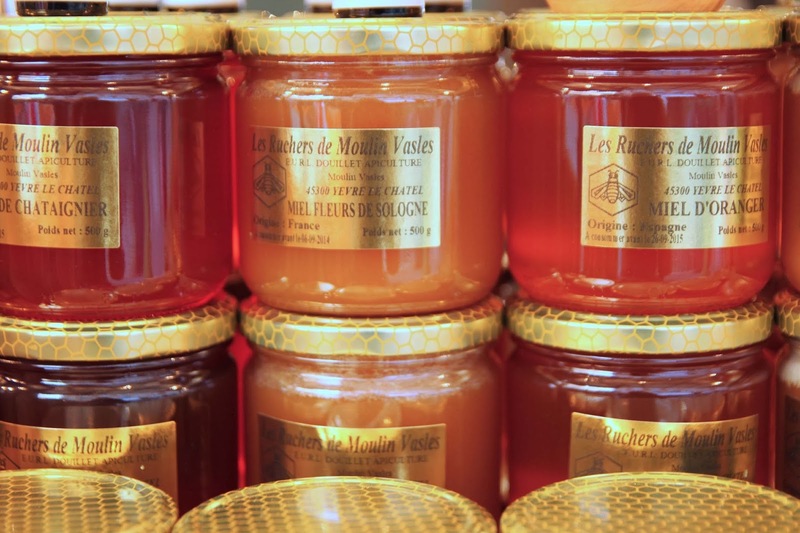 Honestly, it's hard to pick, but I've started offering honey tastings whenever they're something to spread honey on (such as a light, creamy goat or sheep cheese), and even French people (who get in shopping ruts of buying what's familiar, too) wax rhapsodic about the new flavors. Rocamadaour is a very famous, raw goat's milk cheese from Rocamadour, in the Dordogne, and is ont of the oldest known products of the region. It's been known since at least the 15th century, when it shows up in a tax document of 1451 in which the tithing is proscribed in terms of cheese. Despite its ancient history, it's been an AOC cheese -- the "real" version of a Cabécou -- since 1996. There are around 13,600 goats living in the AOC limits. In 2008, the last year for which I can find information, there were 39 manufacturers (36 of them farmers), and they made 30 million individual rounds, each of which is about silver-dollar-sized (palm of a small hand). Rocamadour is a very wet, oozy, cheese. Warmed in the sun, it's even wetter, oozier, and more melted than usual. I couldn't get this cheese out of the silver foil cup if I wanted to. Unless I lick it out. Which I want to. Rocamadour can be aged till it's hard and then enjoyed with more pronounced goat and salt flavors. But it would be difficult to wait that long. It is frequently eaten creamy, with its mild, savory, farm flavor. In the Dordogne, you will see this cheese on virtually ever menu, generally as part of a salad, served on toast and with honey drizzled on top. It's not the only goat cheese that's delicious with a drizzle of honey. But it is the one you will most frequently see served with honey, even in restaurants, and especially in the Dordogne. Chez nous (at our house), we break out all the honeys -- as many as half a dozen bought from Tariq in big or tiny jars -- any time we are faced with a very mild goat cheese. It's an excuse to eat more honey and turns cheese into a full-fledged dessert; like cheesecake, you end up with a combination of creamy, tangy, and sweet.